The fellowship is a two-year program. The first year is a ACGME-accredited fellowship that includes all aspects of interventional cardiology. The peripheral and structural heart training is integrated with the coronary training. The fellowship includes research training including clinical protocols and possibly animal trials. 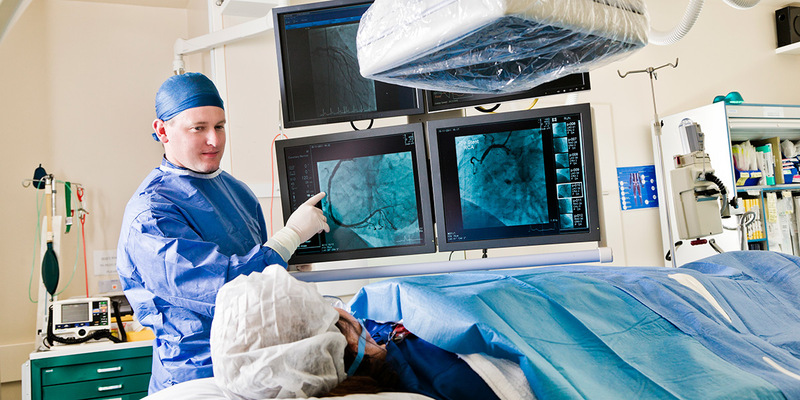 These projects focus on newly developed diagnostic and therapeutic devices for interventional procedures. The second clinical year also involves patient management, including attending on the inpatient service and diagnostic and interventional catheterization procedures in both the coronary and peripheral circulation. Diagnostic procedures include the non-invasive evaluation of peripheral and coronary vascular disease as well as performance and interpretation of diagnostic angiograms and intravascular ultrasound. Interventional procedures include balloon angioplasty, thrombolysis, atherectomy, stent placement, balloon valvuloplasty, laser, and structural heart interventions. The fellow works closely with faculty members sub-specializing in interventional cardiology, but will be afforded a degree of independence appropriate to his/her level of competence. The interventional fellow participates in the teaching of general cardiology fellows while on the catheterization laboratory rotation and while attending on the inpatient service. Opportunities to participate in clinical research trials including the evaluation of experimental devices will be provided. The Ochsner interventional fellowship offers a very unique opportunity to gain experience in acute stroke intervention and elective intracerebral angioplasty during the first and second year. Interventional cardiology, working with stroke neurology to provide comprehensive care, is on call for all acute stroke intervention in the cath lab. Elective intracranial interventions are treated by interventional cardiology with a supportive neuroradiology partner working with us in the catheterization laboratories. Completion of 3 years of general clinical cardiology fellowship training is required. It is expected that the candidate for the interventional fellowship be capable of independently performing diagnostic cardiac catheterization procedures, including a minimum of 200 coronary angiography procedures performed during general cardiology training. The candidate is expected to demonstrate a commitment to academic medicine focused on the percutaneous catheter-based treatment of the entire spectrum of cardiovascular diseases, to include coronary arteries, heart valves, structural heart disease, extremity arteries and veins, renal and other visceral arteries, vascular grafts, and other territories, including the cerebral circulation.